If you liked this show, you should follow new72radio. 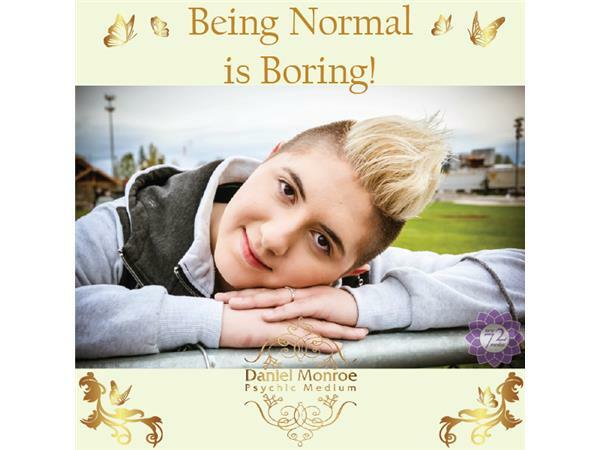 Daniel Monroe grew up being different and an outcast. His upbringing wasn't the easiest being the youngest of seven siblings and parents who to this day cannot accept him for being him and at times were abusive. He faced being bullied in and out of school and abandonment issues. At the age of 17 Daniel Monroe took himself out from that surrounding and found his true self and his full potential and within him he found he is a gifted young psychic medium. Now Daniel Monroe has helped not only himself but over 400 people reconnect with their loved ones by validations and bringing peace and understanding. Daniel Monroe not only has faced his struggling past but has seen what lies on the other side and our passed loved ones. "Being Normal is Boring" is your chance to ask about; spirit, the other side, our loved ones, any myths or any questions you may have. "Being Normal is Boring" is also a place to be yourself and ask about anything that rings in your heart and receive helpful tips on self-care and self-love. Remember Love You Be You! To learn more about Daniel Monroe and to schedule a reading visit his website www.mediumdanielmonroe.com and you can also connect with him on Facebook.